I borrowed the audio book of The Little Stranger from my local library last month and wasn’t quite sure what to expect from it. I truly enjoyed most of Sarah Waters’ previous books. Some to a greater degree than others, but still found enjoyment in reading them. I read several reviews and some people claimed it was her best work to date and others said it was a huge disappointment. I nearly quit listening after the first few chapters. It’s LONG and I wasn’t sure I wanted to commit that much of my time to something I wouldn’t end up liking. Well, I’m glad that I stuck it out. 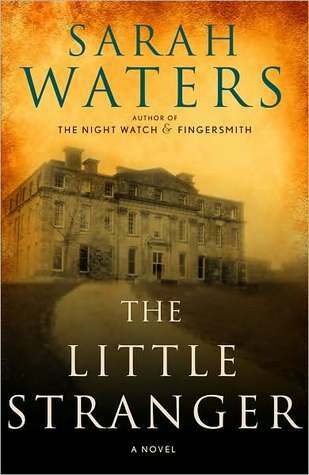 The Little Stranger centers around a Georgian mansion in the mid 20th century. Our narrator, Dr. Faraday, seems quite obsessed about the house and, after a call to take care of a supposedly ailing housemaid, becomes close to the mother, son, and daughter who own it. But there seems to be something very wrong going on at Hundreds Hall and after an unfortunate incident with the family dog and a visiting child, the occupants of the house are witness to, and sometimes victims of, well, something. At least that’s what the Ayers’ and their servants think. Dr. Faraday, however, is quite unconvinced. On the whole, I found The Little Stranger engaging and at times a bit spooky. There were several instances when I completely stopped whatever I was doing while listening to focus that much harder on the scene being described. On another note, if you have an urge to pick up the audio book, the narrator did a great job. I think my only real complaint – that may be a little strong – is that the author has Dr. Faraday go into such minute detail while describing events that took place when he wasn’t there. But now that I’m thinking of it, maybe there’s a reason for that. Hmm… I hadn’t thought of it before. Well, you’ll have to let me know what you think. Feel free to post a comment or find me over at Goodreads where we can hide the spoilers! Hmmmmmm, intriguing. Mayhaps I SHOULD try this one out.